The House speaker drew a hard line on the Employment Non-Discrimination Act in a first-time meeting with the LGBT Equality Caucus. 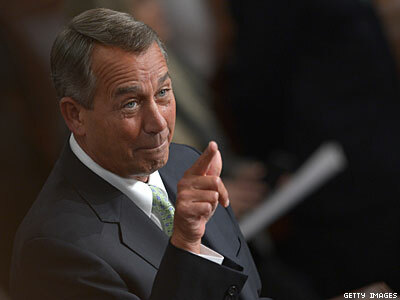 The Employment Non-Discrimination Act has no likelihood of passing this year, says John Boehner. The House speaker told the LGBT Equality Caucus that there was “no way” ENDA would pass, during his first-ever meeting with the group of lawmakers last week. Rep. Mark Takano, a gay congressman and cochair of the caucus, related the exchange Tuesday to the Washington Blade after President Obama’s State of the Union address. Many LGBT activists and organizations have expressed disappointment that Obama had not announced direct action in his Tuesday address. The president has the power to issue an executive order that would offer the protections of ENDA to federal contractors, a group comprising roughly 20 percent of the American workforce. He had promised to make such an executive order during his 2008 presidential campaign. In an op-ed for The Advocate titled “Mr. President, We Need More Than Speeches,” GetEQUAL codirectors Felipe Sousa-Rodriguez and Heather Cronk argued that Obama needs to lead by example and fulfill his 2008 vow. In the United States, protections for LGBT workers vary state by state. Workplaces may still discriminate on the basis of sexual orientation in 29 states. They may also discriminate on the basis of gender identity in 33 states.